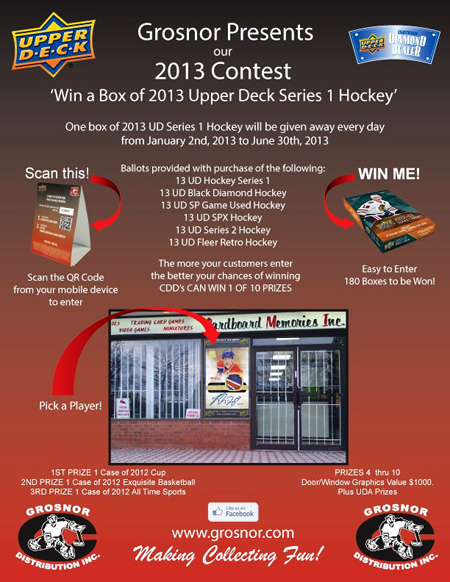 Grosnor Distribution Giving Away an Upper Deck Box a Day for the First Half of 2013! More 2012-13 Upper Deck NHL products available for the promotion will be shared in the future! Upon purchasing any of these products, the collector will receive a ballot with a QR code that they can scan to be entered into the promotion. Grosnor will randomly select a new winner each day and they will share who the winners are on the company’s Facebook page. Upper Deck: What was the inspiration for this promotion? Dave Yeates: In difficult times, people often step up to help out others because they just want to give back. Our customers and hockey fans throughout Canada have been really disappointed about the NHL lockout and we wanted to do something to give back to them in this difficult time for the industry. 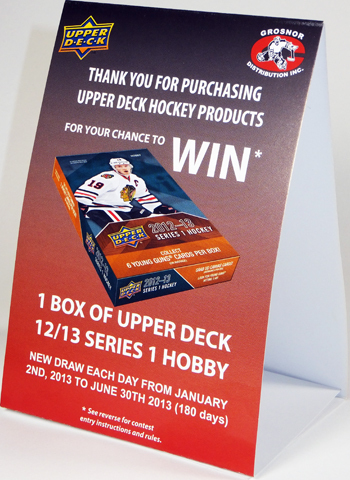 We worked with Upper Deck to develop this program that would help to keep store owners and collectors engaged with the hobby by having a giveaway every day of 2013, through the end of June. We have been successful as a company by taking a personal interest in our customers so it was important to me personally to run a promotion where we could give back to thank collectors and shop owners for their support of our business. Upper Deck: Why should collectors be excited about this promotion? Dave Yeates: Collectors should be excited about this promotion because there are a tremendous amount of prizes up for grabs. The promotion is limited to participating Upper Deck Certified Diamond Dealers in Canada so the opportunity to score a free box is really good. It’s not every day you can purchase a box of 2012-13 NHL Upper Deck Series One and then win another box of the product on top of that! With the QR code, it is very easy to participate and winners we have heard from thus far love the promotion! Additionally it is cool to think that a collector can actually help their local shop win prizes as well for participating. Their will be some cool stories about collectors rallying to help their shop win some of these prizes when this promotion is finished. Upper Deck: How do shops participate in the promotion? Dave Yeates: That’s easy, all an Upper Deck Certified Diamond Dealer has to do is contact their account manager here at Grosnor by calling (416)744-3344 and do something they all do weekly by placing an order for new Upper Deck NHL products. Contest ballots accompany every shipment with one ballot included for every qualifying box purchased. Upper Deck: The window graphic piece that shops can win is pretty unique. How did you come up with that as a prize for the shops? Dave Yeates: Grosnor Distribution recently moved to a larger location so on my new route to work, I drive by one of the shops we service. For the first couple months, I didn’t realize the shop was there because the store signage was hard to read from the street. I started thinking about other shops we service and realized that many just do not have materials in their windows that can catch a consumer’s eye and share the types of products they offer. 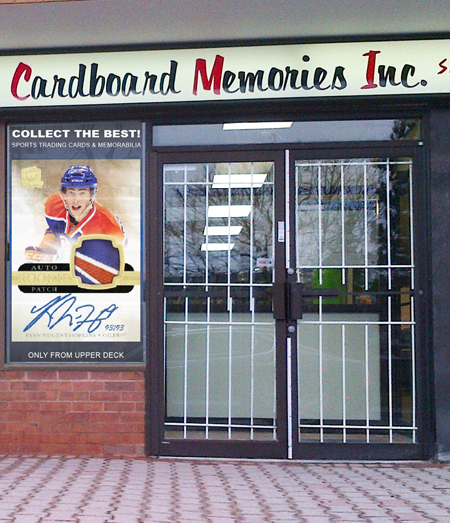 So I worked with a graphics company to see if we could do a custom blow-up of a new Upper Deck card for retailers they could use in their windows to attract customers. I am excited to see how these do once we start announcing winners as the samples we’ve seen look amazing! Grosnor’s 2013 Box-A-Day Giveaway is underway now, but fret not, there is still plenty of time to participate in the promotion with loads of prizes available for shops and collectors! Don’t miss out, get involved today! *Program is void in Quebec.